Add Gigabit Ethernet network connectivity to a Laptop or Desktop through a USB 3.0 port. The USB31000SW USB 3.0 to Gigabit Ethernet Adapter adds a single RJ45 Ethernet port to a USB-enabled computer system, with support for Gigabit network connections at full bandwidth when used with a USB 3.0 host connection, unlike USB 2.0 adapters.This compact USB 3.0 network adapter is backward compatible with older USB 2.0/1.x computer systems (speed limited by USB bus), making it the ideal portable replacement network adapter or laptop accessory. Plus, with support for features such as Jumbo Frames, VLAN tagging and Wake on LAN (WOL), the adapter offers versatile Gigabit network performance for home and business users alike. Add Gigabit Ethernet network connectivity to a Laptop or Desktop through a USB 3.0 port. The USB31000SW USB 3.0 to Gigabit Ethernet Adapter adds a single RJ45 Ethernet port to a USB-enabled computer system, with support for Gigabit network connections at full bandwidth when used with a USB 3.0 host connection, unlike USB 2.0 adapters. 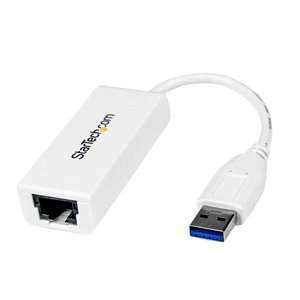 This compact USB 3.0 network adapter is backward compatible with older USB 2.0/1.x computer systems (speed limited by USB bus), making it the ideal portable replacement network adapter or laptop accessory. Plus, with support for features such as Jumbo Frames, VLAN tagging and Wake on LAN (WOL), the adapter offers versatile Gigabit network perforamance for home and business users alike.